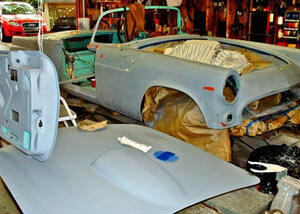 T-Bird Project Part 18 — We Finally Got The Painting Done! Well, Eventually. The bodywork took quite a while, as our past articles have detailed. After finishing all the smoothing work we cleaned the entire surface and sprayed a generous coat of etching primer over all bare metal. This left us with an "army green" finish that not only protects the metal but helps show defects in filler, dents, scratches, etc. The car is moved outside after being primed, chiefly to help visualize defects but also to realign on the lift. 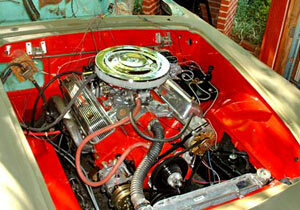 Now we re-masked the engine compartment. We took off the old masking materials to eliminate dust and caked-on body filler that had resulted from wet-sanding. This allowed us to inspect the finish in the bay for overspray and other problems. Things still look pretty good in the engine area, so it's worth the effort to keep it that way! Using paint "runner paper," we masked the entire engine bay making sure the tape adhered continuously around the surface. Runner paper can be obtained at paint stores and comes in long rolls, three feet wide. It is very strong and water resistant and, importantly, quite inexpensive per foot. 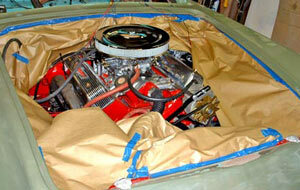 This looks pretty good, so all we need to do is lay a sheet over the engine. The removable sheet allowed us to run the engine if necessary. Once the masking was done we washed the body down and dried it with paper towels. We hung the doors on the garage rafters to allow full access to all sides and bottoms, and also arranged the hood and trunk and other panels onto saw horses. Back to the painting: after wiping down with Prep-Sol, drying, tack-ragging and preparing the intermediate primer-filler material, we sprayed two coats onto the car. The primer-filler (DuPont URO) is a catalyzed urethane product that fills scratches and minor imperfections and also provides a bonding layer between the etching primer and top coat. It sands smoothly and gives one more layer of protection to the metal. The grey URO finish is being sanded and filled, as required. Note the red filler spots on the already-sanded fender. Sanding of the URO layer was done with 600-grit wet-dry paper, all by hand. We wanted to gently sand all defects without digging into the finish. Using sanding blocks and hand-pads (for curved surfaces) we took our time and wet-sanded the entire body. The foam pad keeps fingers from digging into the surface. 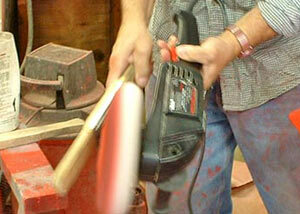 The sanding block prevents mistakes on flatter surfaces. The process related above took nearly 50 hours of actual work spread over two months. Weather, commitments and other factors caused the time to spread out and we forced ourselves to be patient. Anyway, the weather eventually allowed us to prepare the car for its first coat of paint (humidity and pollen went away) so we went through the wash/dry/Prep-Sol/dry/tack rag process and mixed up some of the red color that would be the final finish. Wait! What about a guide coat to find the remaining flaws? Glad you asked about that. 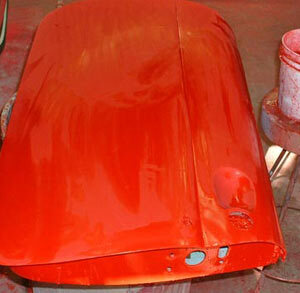 Most painters, at this stage, grab a couple cans of spray paint and shoot a dust-like layer of color over the primer. Then, they wet-sand the color away, leaving only the low spots in the surface - in which the color remains. This is called the "guide coat" and it's a time-honored process. 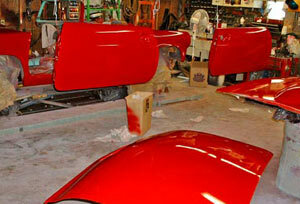 We decided to use the actual red finish paint as a guide coat because we knew we had more than enough for the project. Doing so gave us a very shiny surface, which is the best way to see flaws. We shot the body with one coat of the red paint. Looks pretty good, doesn't it? Once the guide coat cured we wet-sanded the body with 800-grit paper, not worrying about sanding through to the primer in some areas. The process took several days and we carefully inspected each panel for flaws before moving on to the next. After the entire body was sanded smooth we went through the multi-step preparation before putting on the final coats of paint. 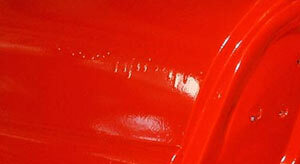 Our paint was DuPont Centari enamel plus a dual-catalyst hardener/gloss additive system called 2000. It was popular about 15 years ago and no longer available, but we had on hand an original package that was unopened. The old System 2000 provided a hard, high-gloss finish that rivaled base/clear systems, so we decided to make use of it. 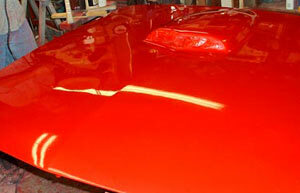 After all preparation was done we mixed batches of the paint and sprayed 3 coats onto the car. It was left to cure for several days. 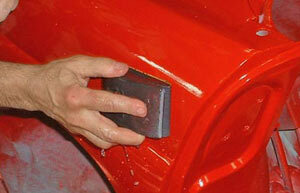 Before buffing and polishing the final finish we had to sand all the "orange peel" out of the surface. To do so we used 1200-grit sandpaper and plenty of water, taking our time to do each panel thoroughly. During this process we found one run in the paint on the right rear fender just behind the door opening. You can just see this run, but it looks bad. Runs are actually no big deal. Careful sanding removes them perfectly, so for this one we got a bucket of water and put some 1000-grit paper on our block. We gently sanded over the surface, checking often to see how far down we'd sanded the run without touching the rest of the surface. After a few minutes we had a perfectly smooth overall surface which would be buffed out. Gentle sanding takes out the run. 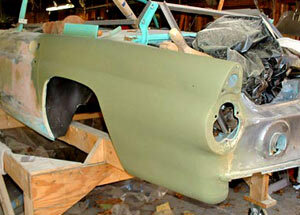 Several days later the body was completely sanded and ready for compounding and polishing. The door looks like it will never shine again, but it will. 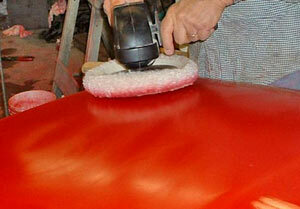 The first polishing was done with heavy duty polishing compound, which is roughly equivalent to 600-grit paper. A ribbon of compound was poured onto a small (about 2 square feet) surface and the buffer pad was used to spread it around. The buffer spins fast and must be kept moving at all times. As the surface heats up the compound dries and starts revealing a shinier area and we kept the buffer clear of edges. Edges were done carefully, keeping the buffer spinning in the right direction to prevent it catching an edge. We're ready to start buffing this dull surface. The compound is starting to dry. The edges are carefully polished. 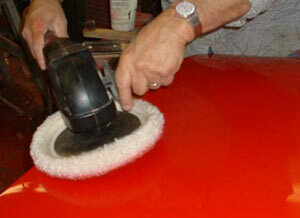 Once a given area was polished we cleaned the buffing pad. 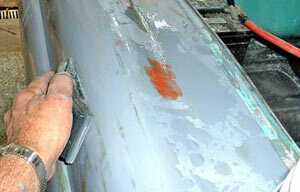 The entire panel was buffed this way and then the next-smoother compound was applied. This compound took out the micro-scratches produced by the first compound. After the second compounding we cleaned things up and did a third compound with a swirl remover. 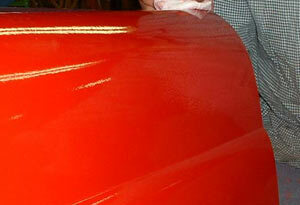 This yielded a shiny finish that can easily be waxed and polished after the car is assembled. 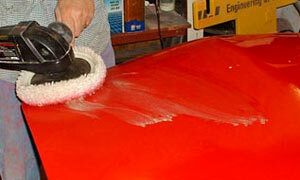 The three-step process on the hood, for instance, took about 2 hours. A toothed "comb" is used to clean the pad. Looks like a factory finish, doesn't it? Needless to say, buffing and polishing the entire car took about a week. It was tedious and unpleasant but the end result is a smooth, consistent finish that can't be beat. Final polishing and waxing can't be done for at least a couple months so that the paint can cure, but we're going to be busy creating an electrical harness and reassembling the car anyway.